Strategic submarines will be strengthened with new technology allowing them to rise quickly to the surface in frozen conflicts. By 2016, Russian submarines will have the ability to cut through thick, Arctic ice without damaging the ship’s housing during rapid surfacing, thanks to a new design that puts advanced technology on the boats. The new technology for the submarines will allow subs to quickly surface for Arctic missions or to rescue the crew in case of an accident, according to the Central Design Bureau for Marine Engineering in charge of the new submarine design. Current submarine design does not allow the ship to break the ice to emerge quickly without damage to the housing. Igor Kurdin, the former commander of the nuclear submarine Yekaterinburg and the chairman of the St. Petersburg Submariners' Club, said that to exit the boat on a surface covered by ice, there are two ways: surfacing without at a very slow speed or, as an extreme case, on-the-go breaking the ice with the ship’s housing. "Surfacing on-the-go is fraught with injuries to the housing, sliding devices, sonar system and torpedo tubes. Today cases of ice breaking on-the-go are unknown, but surfacing without speed is a regular maneuver often used,” Kurdin said. Before surfacing in normal mode, the boat "hangs" in the water, and then begins to rise very slowly - the rate of several centimeters per minute, he said. To ensure a safe ascent while moving, the wheelhouse and the bow of the boat have to be strengthened, since these parts take the blow. The new additions will have management software that searched for the thinnest area of ice, as well as an apparatus that works to clear the housing of ice fractures from the deck as the ship rises. Kurdin said that missile silos, the most important strategic parts of the submarine, are often enclosed by ice while surfacing, so the new design should solve this problem. 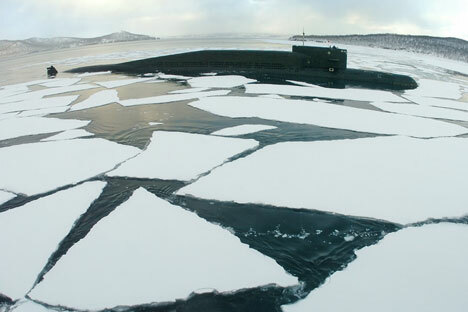 "Surfacing from the ice is done for only one purpose - for the application of nuclear missile attack from a surface position. This is done only in the Arctic regions. After surfacing when people come on deck, the whole deck is in huge blocks of ice," Kudrin said. Designers will now need to develop a rescue camera for the crew, which must also penetrate the ice for the boat can access the air and communicate with rescuers. Rescue cameras will be equipped with radios, navigation devices and signaling buoys. The Arctic submarines will also have a surface point that will analyze ice conditions in the waters of swimming submarines.